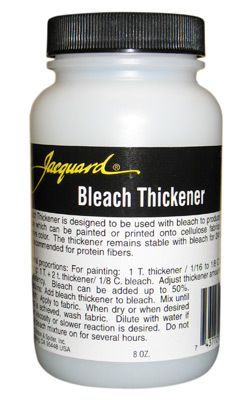 BLEACH THICKENER (SYNTHETIC) 8 OZ. This is a synthetic chemical thickener for bleach, which stays stable for about 24 hours. Other natural thickeners like Alginate and Monogum are broken down by bleach quickly. Add this paste to bleach to thicken it for selectively removing color or discharging designs. Use on Cellulose like cotton, linen, rayon, etc. It is not recommended for protein fibers like silk or wool as you can't use bleach on those. The general proportions are: For painting - 1 TBS Thickener to 1/16 to 1/8 Cup bleach. For printing - 1 TBS / 1/8 Cup bleach (i.e. 1/2 oz/1 oz bleach). Adjust thickener amounts for desired consistency up to 50%. See our "How To" page for Discharging for more info. The Bleach Thickener is designed to be used with bleach to produce a thickened paste which can be applied to fabric in order to remove color. The paste can be painted or printed onto the fabric. The thickener remains stable in bleach for 24 to 36 hours. The bleach thickener is for use on cellulose fibers such as cotton, linen, and rayon. Not recommended for protein fibers such as wool and silk. To mix a solution for painting or printing the following ratios work well. Adjust thickener amounts above for desired consistency. Bleach can be added up to 50%. Always add the thickener to the bleach, not vise verse. Mix until smooth. A small wire whisk works well. Be careful not to splash! Water can also be added to thin the consistency or to slow the reaction for some reason. Paint or print this mixture onto fabric that has been previously dyed. Leave to dry. The longer that the mixture is left on the fabric and the thicker the application of the bleach paste, the more dye that will be removed. However do not leave on for several hours as the bleach may weaken the fabric. Once dry or discharged to taste, rinse, then soak in Bleach Stop or something to deactivate the bleach, then wash fabric to remove thickener. When using the bleach thickener on dyed fabrics you will find various results depending on the type of dye and color that is chosen for the background. We recommend our Procion MX dyes for cellulose fibers. Many dyes will not discharge to a white but rather to a lighter version of the same color and sometimes to another color entirely. Some colors and dye types will not discharge at all or very little. Results may vary. A little experimenting is required! The chart below is old information that we found, but formulas or MX colors have changed over the years and results may differ. Discharging is the process of removing dye (by destroying or altering the dye "chromophores") with various chemicals or bleach, often in pleasing patterns or designs through Shibori or Tie Dye methods, or by stamping, stenciling or block printing. Discharging can be incorporated into more complex designs with over-dyeing other colors or combined with painting, printing or stenciling with opaque Fabric Paints like Lumiere, Neopaque, and Setacolor. Discharging can also be used to "fix" dyeing mistakes. Discharging is one more way to make your own incredible unique fabrics for quilting or clothing. Fabrics discharge with different chemicals depending on the type of fabric and what it was dyed with. Some dyes won't discharge at all, or only with very dangerous chemicals, which we don't want to carry because of safety issues. Also, discharging rarely returns the fabric to its original color or white. Some blacks, for example, will only discharge to a nice reddish brown color, while others will go to a very pale tan. The moral of the story is test test test! Work in well-ventilated areas, and use our Multi Gas/Vapor cartridges for the Deluxe Dust Mask for added protection as the discharging chemicals give off strong Ammonia fumes, or you have the chlorine fumes with the bleach. deColoralnt Paste is a reducing agent. It is fairly safe to use, the main byproduct being ammonia. It is for natural fibers and unlike bleach, it doesn't damage them. It is safe for silk! It removes most Fiber Reactive (such as Dharma's Procion dye), Direct Dyes and Acid Dyes. It is somewhat thick, so you can brush it on, screen it on, stencil it on, etc. You let the fabric dry and steam it with a steam iron or steam in a steamer for 10 minutes or so. You basically stop when it stops discharging, then wash your fabric in a good detergent (such as Synthrapol) and rinse in Milsoft to restore softness. It works well on stuff you dye yourself with the above-mentioned dyes but does not work on the black rayon fabric or garments or black cotton T-shirts we are currently selling because they are dyed with a dye that responds better to bleach. The active ingredient in the deColourant Paste is also available in a Mist Spray which is nice for stenciling. The newest addition to our color removal product line is the Jacquard Screen Ink Discharge, which is made to be combined with water-based acrylic screen printing inks. When the paint or ink is heat set, the Screen Ink Discharge activates and pulls out (any dischargeable) color underneath the screen printed design to allow that ink to really "pop" - great for when you need to screen a light colored ink onto a dark or black fabric and don't want to apply several coats of paint. The neat thing about the Screen Ink Discharge is that it can also be used as a stand-alone product or thickened with Sodium Alginate or SuperClear and applied as you would apply the deColourant Paste. Thiourea dioxide is also a reducing agent. It is used to remove most Fiber Reactive (such as Dharma's Procion dye), as well as some direct dyes and acid dyes. It is especially useful on cellulose fabrics since it is used in conjunction with Soda Ash. It is sometimes used on silks or wool, but one should always keep in mind that Soda Ash is harmful to those fibers, and they should be neutralized with vinegar afterward. Thiourea dioxide is usually used as a full immersion bath for removing the color from a whole piece of fabric. It is therefore sometimes very handy for correcting dyeing "mistakes", or lightening a fabric for over-dyeing. A dyed fabric can be tied into a pattern or design as in Tie Dye or Shibori, then put in the discharge bath for interesting effects. Add damp fabric to the above bath and heat to a simmer. While simmering, add 1/4 additional teaspoon Color Remover every 15 min for a total of 1 hour (so an additional 1 tsp Color Remover, total). Simmer for an additional 15 minutes. Frequent gentle stirring throughout the process gives more even results, just as with dyeing. You can add more color remover if necessary with no harmful effects. Remove, rinse, and then wash your fabric in a good detergent like Synthrapol. You can also use Milsoft in the final rinse to restore (and then some!) the softness and drape of the fabric. Also known as Spectralite, Color Remover is often used in conjunction with Soda Ash for indigo dyeing. Combine the water and Alginate in a blender, or add the Alginate to the water while stirring rapidly. Then stir in the Color Remover and the dissolved Soda Ash. Let the mixture sit for at least 10-15 minutes to thicken. Paint or print onto the fabric. Before it is quite dry, it needs to be steamed 10-20 minutes, or it can be ironed with the steam on until the desired results are achieved. Protect the iron and ironing board with paper towels. Wash and rinse thoroughly as above. Above is an example of our Black Rayon Fabric discharged with 100% bleach. This is the fabric we make all our black rayon clothing out of. Rayon is weaker when it is wet than when it is dry. We used full strength bleach on some black rayon to discharge it and rinsed it immediately after it discharged for a minute or two and both the discharged areas and the untouched black areas ripped very easily in one direction when pulled. After the fabric was dry it did not rip, even where bleached. You have to treat wet rayon very carefully, and it is not the discharging (if done properly) that is making the fabric weak. It is important to support the whole garment if you are going to lift it out of a dyebath when wet. Just grabbing part of it with a stick or other object could cause it to rip. Bleach is a strong oxidizing agent, which is very hard on fabric (it really destroys protein, so use something else on silk or wool!) and has to be used carefully! The advantage of bleach is that it discharges a larger variety of dyes than the safer reducing agents like Thiourea Dioxide and Discharge Paste. For best results bleach should be diluted with water so it doesn't just burn right through your fabric, then neutralized with Bleach Stop to stop the action, as soon as the desired or maximum results have been achieved. However, if testing proves that only full strength bleach will work (like on our Rayon), just be extra careful - keep an eye on the progress and as soon as you have achieved desired results (should only take a few minutes!) rinse and neutralize the bleach immediately! Bleach solutions for a discharge bath or spray can range in strength from 2 TBS per cup water (1:8) to full strength bleach. You often have to test each different fabric with different strengths - the ideal goal is to use as weak a solution as you can to get the desired results. Start testing with a weak solution and work your way up to a stronger one if necessary. Heat helps the process, so the warmer the water, the quicker the reaction. Remember to rinse as soon as it looks like the action has stopped or you have achieved your desired results, then neutralized with Bleach Stop (directions below) to stop the action of the bleach so your fabric won't be damaged. Then rinse and wash thoroughly as below. Rinse and wash your fabric in a good detergent like Synthrapol, and you can also use Milsoft in the final rinse to restore (and then some!) the softness and drape of the fabric. Bleach and water can also be combined with a thickener to make a discharging paste, which can be painted, stenciled, stamped, etc., onto your fabric. You can use the old standby, sodium alginate to thicken it, or our new Bleach Thickener, which stays stable longer in the presence of bleach (24-36 hours!). Some books have recommended a product called Monogum, which breaks down (turns too liquid) even faster than the above-mentioned thickeners. The Bleach Thickener is designed to be used with bleach and water to produce a thickened paste which can be applied to fabric in order to remove color. The paste can be painted or printed onto the fabric. The thickener remains stable in bleach for 24 to 36 hours. The bleach thickener is for use on cellulose fibers such as cotton, linen, and rayon. Not recommended for protein fibers such as wool and silk. Following the percentages above add bleach thickener to the bleach until mixture is a smooth, thick and even consistency. Paint or print this mixture onto fabric which has been previously dyed. The longer that the mixture is left on the fabric and the thicker the application of the bleach paste, the more dye that will be removed. However do not leave on for longer then several hours as the bleach may weaken the fabric. Once dry or discharged "to taste, wash fabric to remove thickener. You can use the Bleach Stop above to neutralize the bleach. If mixture is too thick, or you want a slower, or less of a reaction, you can add some water. When using the bleach thickener on dyed fabrics you will find various results depending on the type of dye and color that is chosen for the background. We recommend our Procion MX dyes for cellulose fibers. Many dyes will not discharge to a white but rather to a lighter version of the same color and sometimes to another color entirely. Some colors and dye types will not discharge at all or very little. Results may vary. A little experimenting is required. ~4-8 tsp Sodium Alginate (experiment with the thickness until it meets your needs)-use HV unless drawing fine lines with an applicator. Put the water in a blender, ideally, and sprinkle the alginate in slowly while the blender is going. Allow to set for 2 hours or so to continue thickening. Use this thickened water to dilute your bleach, substituting it for the Bleach Thickener above. It will go bad somewhat quicker, ie. turn liquid, so only make as much as you will use fairly quickly. The thickened water by itself will store nicely in the refrigerator for a few weeks - just give it a clear non-food label! With both of the above thickened bleach methods, after you have painted, stenciled, printed or screened the mixture on, let sit 5-10 minutes or until the desired amount of color is removed. Then rinse thoroughly in warm water and soak in your Bleach Stop solution as above. Next wash in Synthrapol, then you can use Milsoft in the final rinse to restore softness. Work really well with bleach. Be careful and follow directions.Very Strong order and fumes!! !I have severe Asthma so I used a respirator to protect my lungs. Best to use outdoors.I had really great results using this on solid Indigo Mud Cloths. This makes a great stamping paste to remove color. Dharma trading gave me really good advice on this product. 5 stars in customer service. The product works well and keeps the bleach where you want it. The only problem I found is that does not stay stable nearly as long as they claim. Usually after an hour or two it breaks down and the bleach thins out considerably. So it's important not to make more than you can use within an hour or two.